The recent election in the US had a hashtag #Election2016 and an emoji, signs that the language and influence of social media has well and truly made its way into daily life. Media, voters, supporters, detractors, spectators around the world connected with a click on Twitter, Facebook, Google, YouTube and Snapchat for live debates, poll locations, sample ballots. Foursquare helped hungry voters find their nearest ‘democracy sausage’, which trended of course with its own hashtag. The power of social media was felt at every step of the election journey, it helped prepare voters, predict trends; computer glitches necessitated changes to polling hours, crystallising the integration of social technologies with life. Social is a powerful media channel with live streaming allowing unprecedented engagement. Behaviour is complex, politics more so and the 2016 election was unlike any other with Pew Research showing widespread polarization and partisan animosity and voters worn out by political information. While that makes it hard to unpack the influence of social media on voting preferences, the impact on related behaviours like increased registration were there, although at this stage there are no firm figures on how well that translated into actual votes. It included practical information to help voters navigate the system like sample ballot papers that could be filled out in advance and the location of polling booths. Facebook showed a reminder in the news feed encouraging US citizens to vote on the day, according to past research millions of additional people vote because they’re encouraged by a Facebook friend to do so. This is not the first time that Facebook, embedded in the lives of1.79 billion global and 170 million Americans, has used its powerful algorithms to encourage civic engagement. I’m not precluding an influence on preferences, Sifry has suggested increased voter turnout may disproportionately advantage Democrats because there are more Democratic than Republican Facebook users but this is not widely accepted. 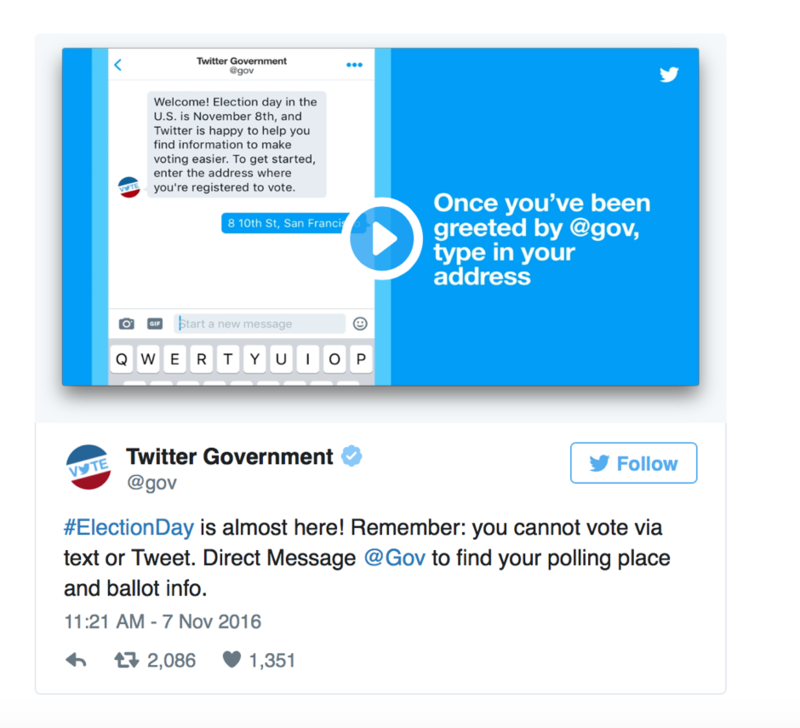 Twitter encouraged political participation by establishing @Gov in September. The initiative included a partnership with Rock the Vote and new ways to register to vote, a process that is not always easy in the US. Voters sent a direct message (DM) to @Gov with a five-digit zip code and were sent registration deadline and a personalized link to get registered. YouTube and Snapchat both focussed on galvanising young people who traditionally have a lower voter turnout, 46 percent of eligible millennials in 2012 according to Pew Research. 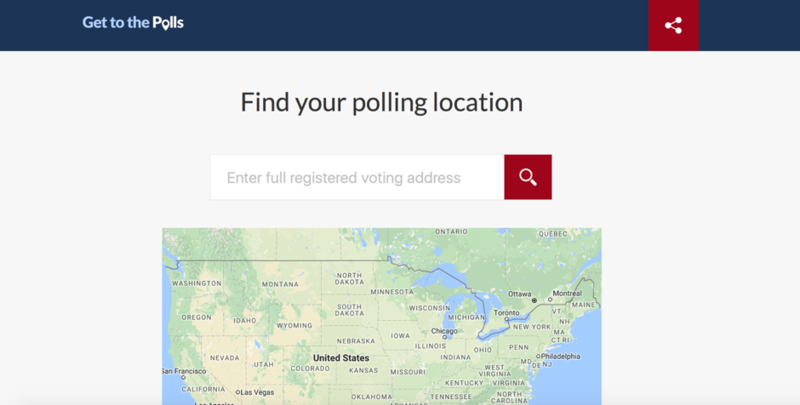 To get young people to the polls Snapchat partnered with TurboVote, 10-second videos created by celebrities encouraged voting and Snapchat users could swipe up on the app and be directed to register.turbovote.org to sign up. Business insight – create clear content with clear calls to action on social media to activate behaviours you want. While modern polling was once again shown to be an inaccurate barometer of political outcomes (Brexit, Australian Federal Election) trend data accurately predicted some behaviour, including higher voter registration. 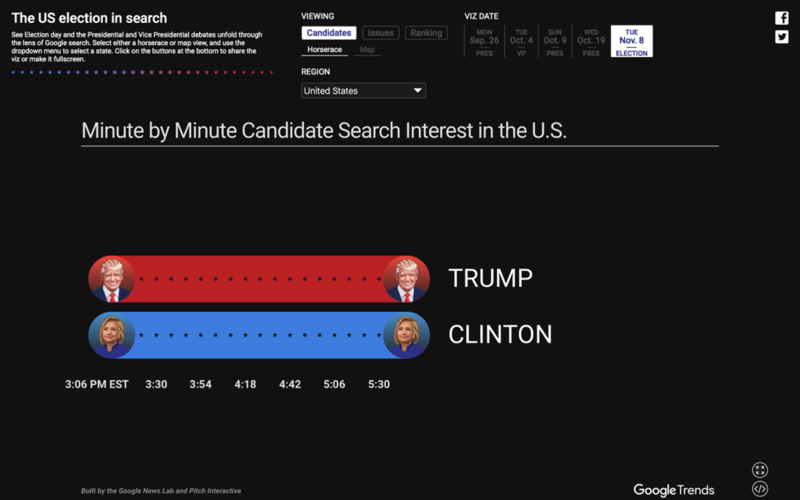 Before the election Google’s knowledge graph (which shows trend data in real time) gave some startling insights on the power of search, for example there was a 233 percent increase in traffic for the term ‘how to vote; compared to the previous election. Election results were integrated into Google search in more than 30 languages and a special site provided election results in real time. Not surprisingly, #election2016 and its variations trended top on Twitter, prior to the election there was high interest in live streamed debates and active support of voter registration. Calls for civic participation may have led to higher registration and activated some disaffected voters, although we will need to wait for final turnout numbers. Business insight – Use social data to leverage trends and deliver targeted, timely marketing. Create and share content using research that gives you excellent insights into customer search patterns and leverage trends. 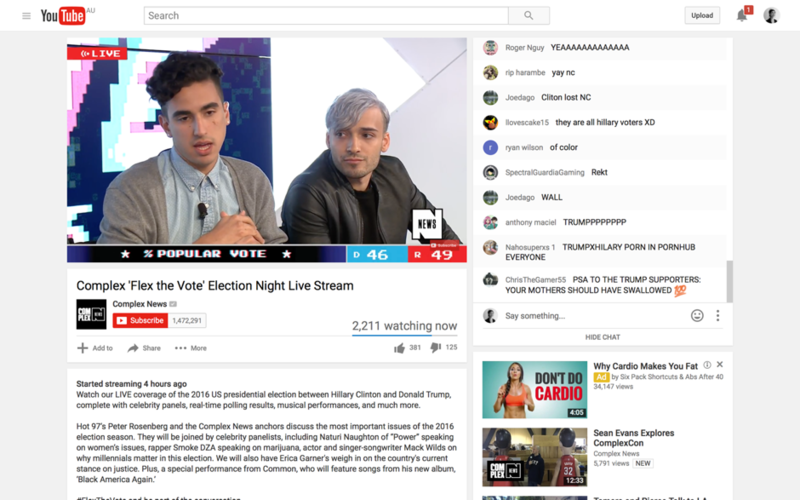 Huffington Post blogger Jay Shetty @JayShettyIW cleverly hashcrashed #elections2016 to point punters to a live meditation on Facebook. The peaks and troughs of any population data (like coffee drinking by the hour) can be used to make targeted business offers. Social media is a powerful news channel with real time, direct access an audience of billions. Online interest in the election was high, according to Nielsen over 84 million people tuned in to see Clinton and Trump debate before #election day and social media channels were central to content creation and distribution. Almost 3.2 million viewers watched the live stream of the second presidential debate directly from their Twitter feeds, making it more popular than the NFL Football live stream. 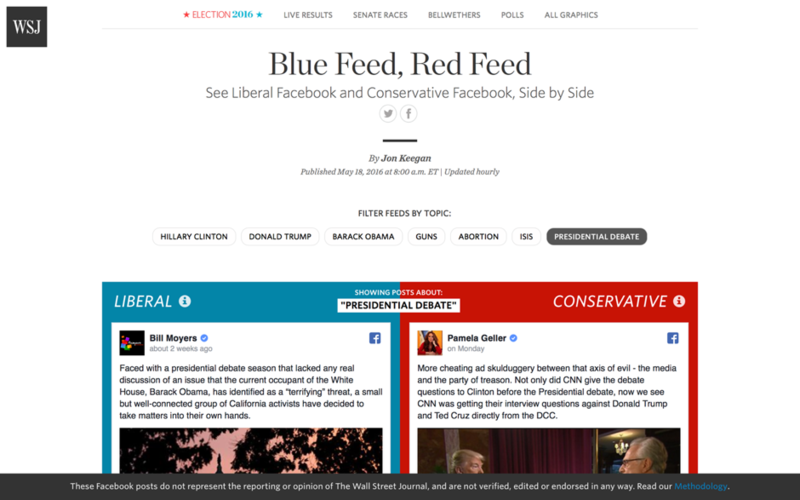 On #electionday Buzzfeed streamed coverage and results live. You Tube live streamed election day from NBC, PBS, MTV, Bloomberg, Telemundo and The Young Turks as well as live streaming partnership with Complex. Like other social media networks, Facebook was central to the election process for candidates and voters. Throughout the election candidates took to Facebook Live to hold their own unplanned, real time news conference on hot topics. Facebook CEO Mark Zuckerberg has argued that the giant is not a media company because it does not create content. However, in this landscape distribution is as important as content creation and the newsfeed algorithm helps define what news is by determining what users see. Facebook’s news feed is so powerful that Zuckerberg was called to The Hill to discuss whether Facebook curators were editing out conservative content. Politicians know that 54% of 18-24 year olds get pretty much all their news online and that across age groups content is shared, discussed and influences views. A recent brilliant graphic in the Wall Street Journal showed how the Facebook algorithm serves content to Democratic and Republican supporters. Business insight – use social media to become your own media channel and live streaming to help customers take action in real time. Transport NSW and Twitter allow commuters to receive instant, personalised alerts to their mobile devices, helping to better plan around travel disruptions. The Victoria Racing Club (VRC) partnered with Twitter to stream the 2016 @Emirates Melbourne Cup to an Australian and global audience. 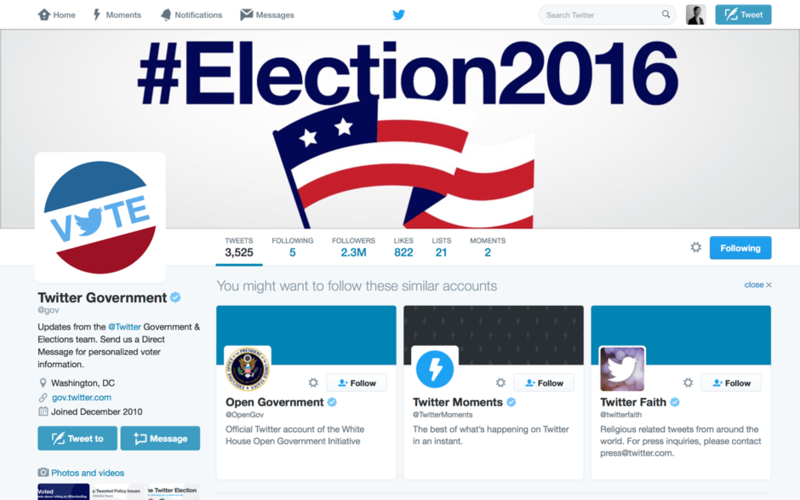 Social media & #election2016 were enmeshed. The impacts of social data, activation and information are just as powerful for the rise and fall of your business – know what they are and how to leverage them. This entry was posted in Leadership, Social media. Bookmark the permalink.